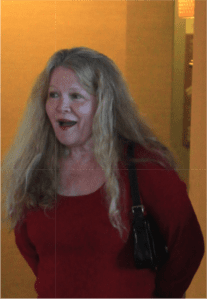 In 2013, my mother turned 60. I wanted to mark this milestone birthday in a special way. Mom and I had been through a literal lifetime of challenges and triumphs together. I wanted her to know how much I loved her and appreciated her steadfast presence and devotion. She was healthy and happy, and the best years were to come. I wanted to help her bid farewell to the past and welcome the new. Mom was born into strife. At the age of nine, she was uprooted from the stability of the German countryside and moved around American military bases with her mother and GI stepfather. At fourteen, she met my father; he was 35 years old, married with 5 children. While still a teen, she gave birth to me. The following years were as frightening as they were challenging. Her family and community ostracized her. Mixing races and being unmarried were both sources of deep judgment and shame back then. Feeling unworthy and alone, we were all we had. The world was harsh and unwelcoming, and the only way we’d survive it was to stand back to back and fight our way through it, together. As a teen, I too made poor choices. I became a young mom, dropped out of school, and I chose a man no mother would want for their daughter. My mom stood by unwavering in her love and understanding. She refused to do to me what had been done to her. When I left my son’s father and miraculously turned my world around, mom helped and cheered me on. When I had the privilege of building my dream home, I built a luxurious suite for her. I wanted to give her everything. While my success brought her joy, I never saw her feel personally happy or fulfilled. The impact of her adolescent relationship with my father rippled through the decades, undermining and disabling her. She dreamed of Hollywood glamour and falling in love, but she couldn’t believe in love, trust, safety, or success for herself—only for me. For her birthday, I wanted to do something special. Having come from struggle and hard work, I tend toward practical and intelligent gift choices, and Mom had only 8 car payments left on her car. Paying it off seemed like a great gift, but somehow it just didn’t feel right. My inner voice kept nudging me to think bigger and less prudently. Visions of a swanky Hollywood gala kept coming to mind. My logical mind put up a massive fight: Why waste money on something with no tangible and lasting value? My tender heart quietly responded: Live now, do it. Weeks later, the vision was complete. I would throw her an extravagant old Hollywood surprise party in a penthouse suite at The Beverly Hilton, a classic Beverly Hills hotel where Marilyn Monroe, Ester Williams, Judy Garland, and several presidents enjoyed the life my mother desired. I invited family from out of town, and I went shopping for glamorous items my mom didn’t need but would love to have: a sterling silver vanity set with a mirror, hairbrush, and jewelry box. I added a luxurious silk nightgown, slippers, and ornate candles. I ordered two birthday cakes, a case of champagne, and an enormous selection of assorted fruits, cheeses, meats, and crostini. A few members of my family and I went to the LA wholesale flower market and purchased 20 dozen white flowers, roses, hydrangeas, peonies, and chrysanthemums. We wrapped her gifts in silver and white paper and ribbons. 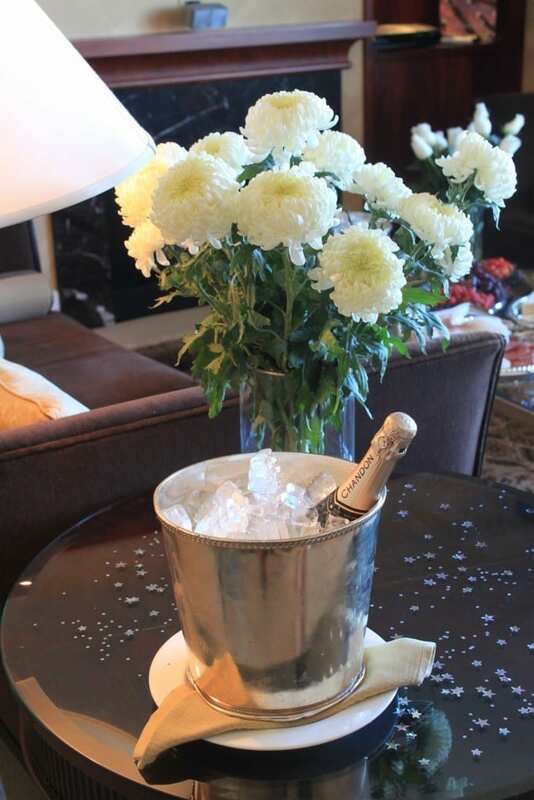 On the morning of the party, we filled the suite with flowers, cakes, champagne, and candles. 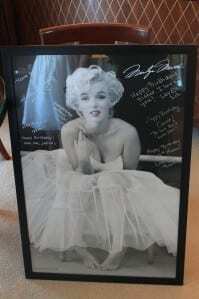 Instead of a birthday card, we signed our birthday wishes on a framed poster of Marilyn Monroe. 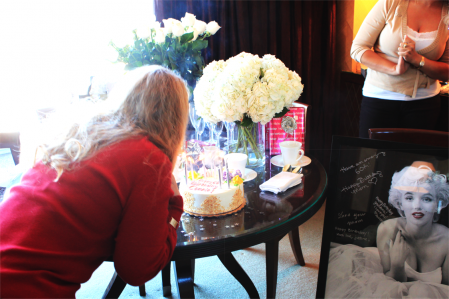 I opened the door to the suite and turned around to witness one of the most beautiful experiences of my life. Mom’s mouth dropped open as she stepped into a room of smiling and cheering faces. Stunned, she attempted to reconcile her thoughts with the gorgeous reality in front of her. She hugged everyone and then became quiet, eyes moving from place to place. Restraining tears, she thanked me. She held me tightly and confessed that this was her dream come true. That day, she lived like the woman she’d always wanted to be; she swam in the pool, dined at all of the restaurants, took a bath in a tub large enough for three, drank champagne, and walked on rose petals—all while surrounded by the same love she’d given so completely. For the next two years, barely a day passed without Mom making a reference to what she called, “my best birthday ever.” It became a treasured memory. On Sunday, May 15, 2016, my beautiful mother passed away. 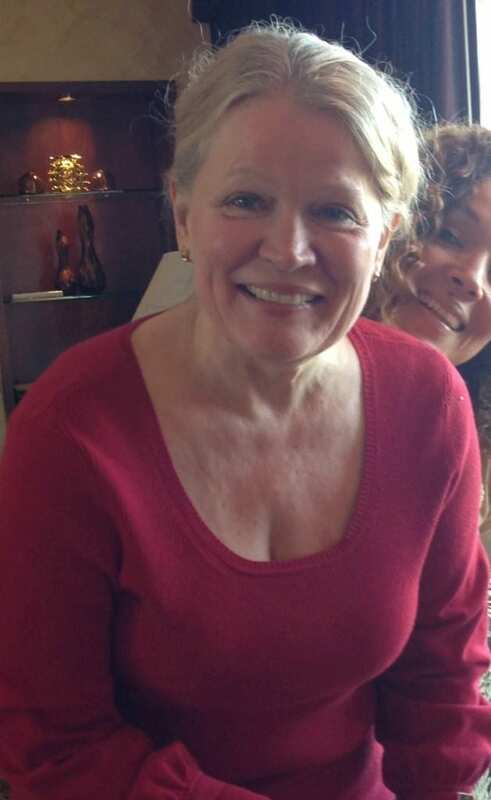 She died of a brain tumor that emerged three months after her 60th birthday. We gave our all to saving her, it wasn’t her destiny. At the end of her life, every part of her physical being shut down. What we call death was a merciful release. With a heart as heavy as the moon, I surrender her to the Infinite knowing that a life is the breath between a soul’s heartbeat. It is ordered, eternal, and perfect. All is well, even now. 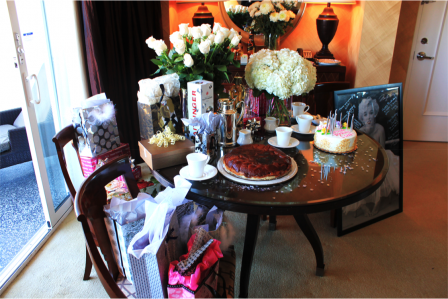 Reflecting on her 60th birthday celebration, I see clearly. It was not an ushering of the future; it was a Divine conspiracy to celebrate her life. I am deeply grateful that I listened, I’d forever have regretted missing those moments. To my mother, thank you for loving me for every second of my life. I ache without you. I love this memory of your mom’s and yours. Thank you for sharing your “Wonderful Moment”. In a huge amount of pain this morning and I had planned to miss our Family Gathering my (81 years young) mother has organised as pain levels will increase further if I go. Poetic and deeply moving tribute. What a beautiful story and celebration of your mom’s life.